An essential issue for transmedia projects is word-of-mouth. It is of course essential for any other project as well, but especially for transmedia projects as their eventual success is often quite dependent on audience engagement and interaction. With regards to this, there are few things as effective as word-of-mouth marketing to foster audience engagement. 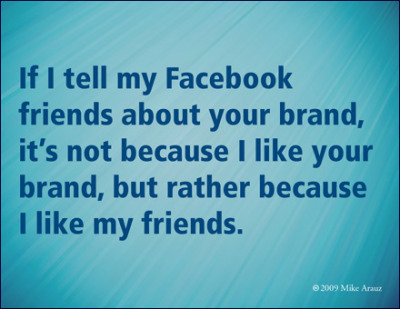 To quote Mike Arauz – ”I tell my friends about your brand, not because I like your brand but because I like my friends.” This is where you want your transmedia project to fit in. It should be something so good that people feel they are doing their friends a service by sharing it with them. This again all goes back to the content, the story and the execution. My wife has returned to university to study digital media, marketing etc. This has lead to me reading and discussing issues important for my work as well over dinner or breakfast. One study I stumbled upon was quite interesting. It’s a study about word-of-mouth marketing from last year from Search Engine Land and the article is by Corey Eridon. One interesting note, for instance, is the type of businesses that are likely to be recommended through word of mouth. It turned out cafés and restaurants are more than doubly certain to be word-of-mouth:ed than for instance car hire firms or wedding shops. Why? Simply because they get visited a lot more frequently. What to take from this as a producer? NEVER GO DARK. Always have something new or semi-new available for your audience to experience and share onwards. The three highest scoring variables when looking at why people would recommend a business were ”friendly & welcoming”, ”reliable & professional” and ”cheap at the price.” Granted, this is for companies and brands, and not media content and media projects. What I as a producer can take from this is the need to do proper UX research. I must not confuse the user. I must not alienate the audience. I must not charge for something that everyone assumes will be for free. Lastly, adding an incentive for the user to share your project onwards will increase the likelihood they will do so. While ”asking them to share onwards” had only a 16% impact on word of mouth activity, a whopping 75% stated yes or maybe to promoting a business if there was a personal incentive. What I’m taking from this is a leaf out of the crowdfunding book – have one level where the first 100 or 500 or 10000 to recommend your project will receive something. An exclusive download, a badge, perhaps even something physical. There are, of course, a great number of articles and studies on word-of-mouth-marketing out there. I would strongly suggest any producer in the cross media, transmedia or interactive field would acquaintance themselves with some of the studies and the case studies. It can only help whatever project you find yourself working on. Thanks Rhys. Yeah, provide something meaningful for people – an incentive, that also preferably plays a part in your story – and you should see traction!